Curren$y, Big K.R.I.T, Smoke DZA & More Embark On "The Smoker’s Club Tour 2010"
Speaking down below of what the hell else these guys are doing with all the music and growing fan-base, I see this. A weed tour, how original. 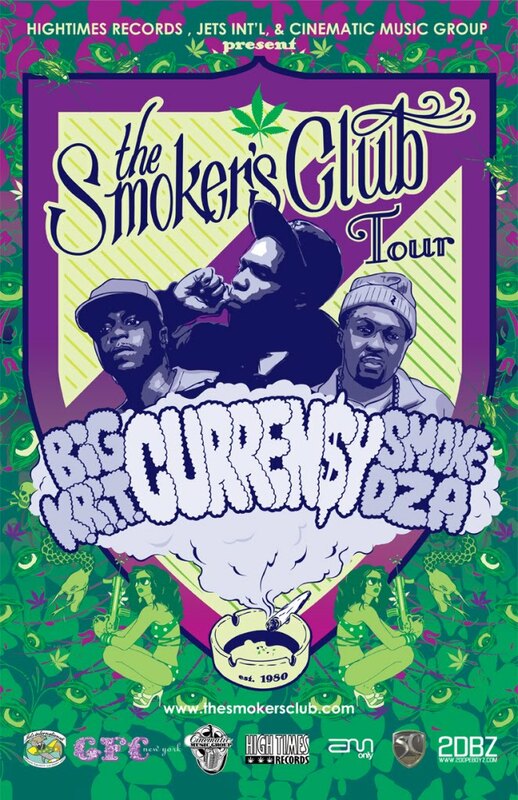 HIgh Times Records, Cinematic Music Group & Jets Int’l present “The Smokers Club” Tour. Curren$y, Big K.R.I.T. & Smoke DZA along with Mac Miller, Corner Boy P, Fiend & Boaz will be rocking in a city near you starting Oct 1st. Tickets go on sale everywhere friday, special limited pre sale tickets are on sale now at www.wantickets.com/thesmokersclub This Saturday at the Rock Yard in Brooklyn Jellynyc will be hosting the official launch party for The Smokers Club featuring live performances by Curren$y, Big K.R.I.T., Smoke DZA, Trademark Da Skydiver, and Dj Wally Sparks on the 1’s & 2’s. Come smoke out BK with the entire lineup.